Think about it: this is February 14, St. Valentine’s Day, the 45th day of 2018. 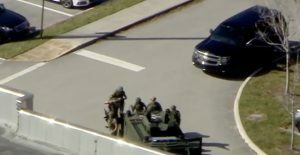 The school shooting at Marjory Stoneman Douglas High School in Parkland, FL is the 18th school shooting of the year. Do the math: that’s a school shooting every 2.5 days. There are at least 17 dead from this latest school shooting, over a dozen wounded. Ah, remember the good old days when we only had a school shooting every few months? We didn’t do anything about the problem of mass shootings then, we didn’t do anything about mass shootings after an insane man with an assault weapon entered Sandy Hook Elementary School and killed 20 small children and six adults. We didn’t do anything about it after the mass shooting in Las Vegas — the deadliest mass shooting in U.S. history — if you don’t count the massacres of Native Americans, like at Wounded Knee, SD. Who are the at-risk students? Which ones might be prone to violence, suicide or homicide? Why are people on the terrorist watch list allowed to buy firearms? Why do we allow people to buy ammunition magazines that can hold more than five rounds? Forget the discussion about whether or not people should be able to buy assault-style weapons like the AR-15 and its geared up baby, the Bushmaster. Most firearms in America are semi-automatic. Hunting rifles of all sorts, target rifles and handguns. Banning semi-automatic weapons would be crazy in itself and banning assault-style weapons — well how would one describe it in a comprehensive law when gun manufacturers have already created the same weapons without pistol grips, flash suppressors and folding/telescoping stocks. But the guns with all those gadgets are much more cool. Ever fire a weapon on full automatic? I have and it was fun. Every fifth round is a tracer so at night it’s really fun. Even shooting semi-automatic is cool, especially when you are good at it. Many U.S. Marines take a lot of pride in being able to shoot a human silhouette dead center at 500 meters without a scope. That’s just under 547 yards, or just over 6,561 feet. And that distinctive smell of cordite — which isn’t actually cordite. It’s actually the sulfur and other propellants (nitro-cellulose) used in all but small caliber weapons like .22s. Cordite went out of style around the time of World War II. The smell of a burnt propellant is like that — it’s intoxicating. Makes you want to do it again. Personally I don’t care for it anymore, don’t really like owning firearms, but in this day and age I’ve pondered the need of having a 9-mil handy … but what would I do if it was something other than a poorly-executed home invasion? Just over nine years ago I was attacked on a trolley stop in Sandy Eggo. I came out okay with no bumps or bruises, although my nerves were rattled. But it happened so quickly that even if I had a weapon, concealed or otherwise, there was not enough time to pull the weapon, release the safety, chamber a round, aim and fire. There was a lot of “The best way to stop a bad guy with a gun is a good guy with a gun” after the guy shot up a movie theater showing a Batman movie in Aurora, CO. In a darkened movie theater how would you know which shooter is the bad guy? Even in a well-lit area, how would you know? No, arming everyone in America is a non-starter when you look at it logically. We already have more firearms in the U.S. than citizens anyway and we still average a school shooting every 2.5 days. On the day of the Douglas High School shooting I heard former ATF and FBI agents talking about gun violence and both agreed it was a societal issue, not just a legislative issue. Gun-owning parents should lock up their guns and ammo separately, make it all hard to access without the key or combination. Teach kids how to cope with adversity, how to deal with bullying, rejection, unhappiness. We could also end the sale of gun magazines that hold more than five rounds, we could also require background checks for every gun sale — we could actually make existing laws enforceable. And for the sake of America don’t pass the bill allowing the reciprocity for state-level gun rights, which would essentially make open carry the law of the land. It passed in the House of Representatives and is now being debated in the U.S. Senate. Maybe this time thoughts and prayers will work and gun violence will end, but I doubt it. Gun violence is as American as apple pie. Tim Forkes, you are either a disingenuous liar or ignorant buffoon. Either way, it just goes to prove that the truth is inconvenient and therefore your article must ignore and mislead. I will pass your suggestion on to the editors. How pathetic. You spent hours writing a sophomoric article which resulted in one comment. At least tou can say half your readers leave comments. Very compelling stuff. Then it took you five days to respond, the best you could muster was “Barney Fife”… lol. You are pathetic. Worse than being an emotional wreck, you are a misleading liar. Stop hanging around schoolyards and playgrounds, thats inappropriate conduct for a lone adult male. Okay Barney. I’ll leave the schoolyards and playgrounds to you. You are a punk. And bragging that you sat at dinner with the “greatest demorat political minds in Wisconsin… and your mommy” didn’t work out so well for you because you are still a dummy. But there hasn’t been an article written by you that resulted in this much activity (one person responding) let alone being read, so I might as well keep it going. Perhaps it will prevent you from overdosing yourself or molesting a child… give you something else to do.